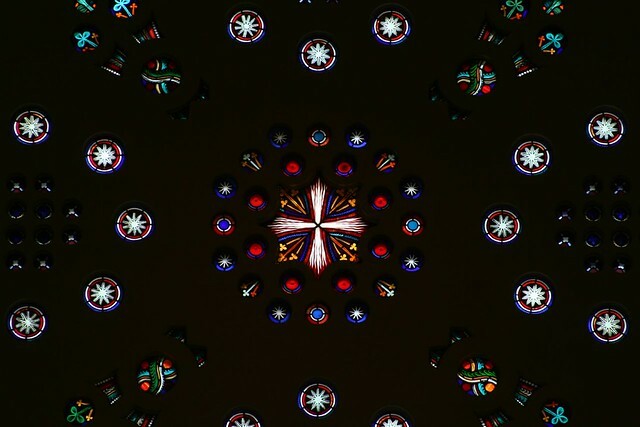 One day last summer I was looking at a map of the city, looking for places I hadn’t been. 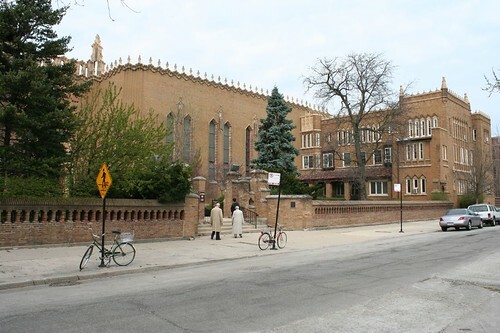 I realized I couldn’t remember ever venturing west on Irving Park, so, off I went. 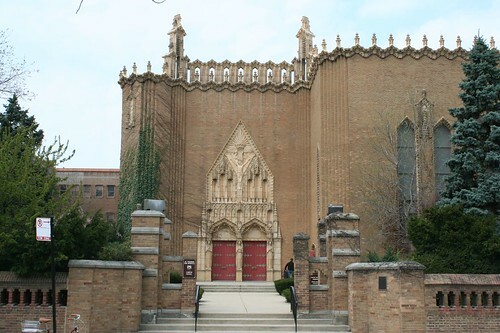 I saw lots of neat stuff, including beautiful Portage Park, but the king find was St. Pascal’s Church, a 1930 Catholic structure which was a bit of a jackpot for me. 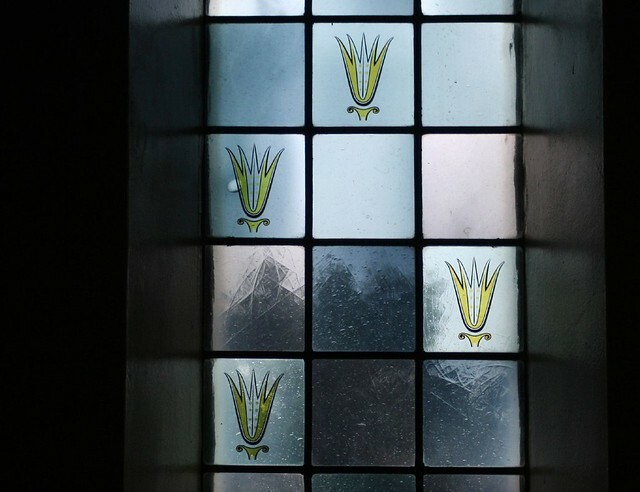 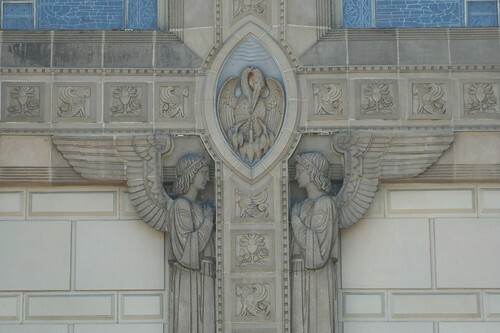 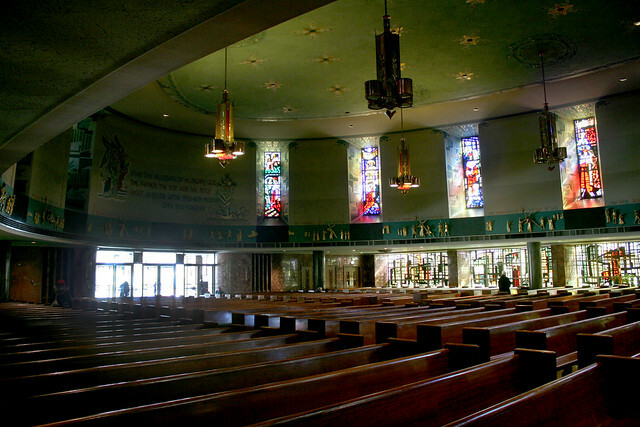 There is a paucity of Art Deco churches in general. 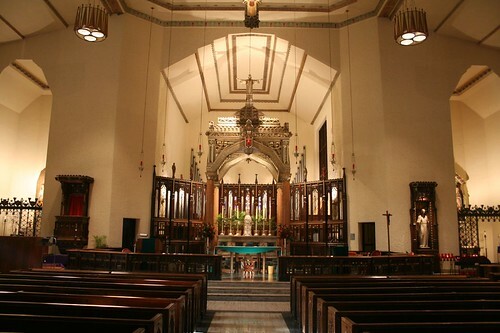 I know of two in St. Louis, and perhaps half a dozen in Chicago, and I am still looking for one that carries the style all the way into the interior. 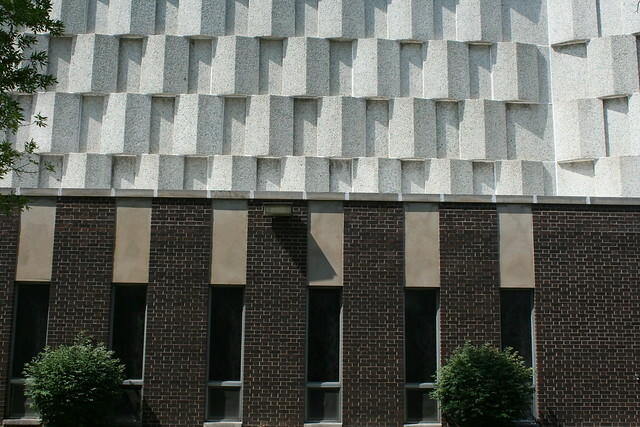 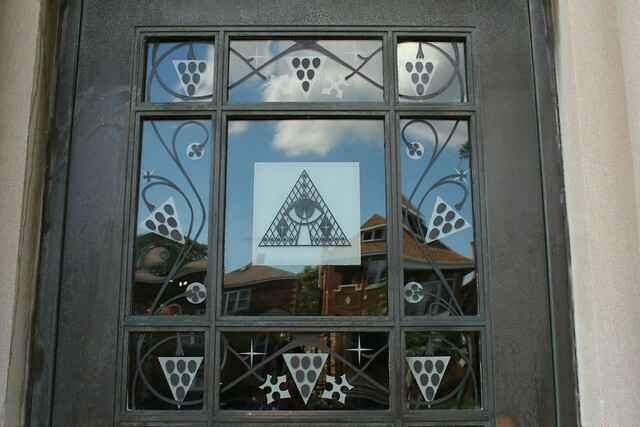 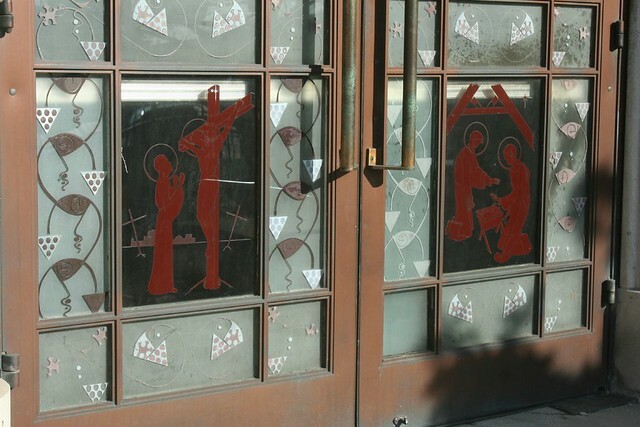 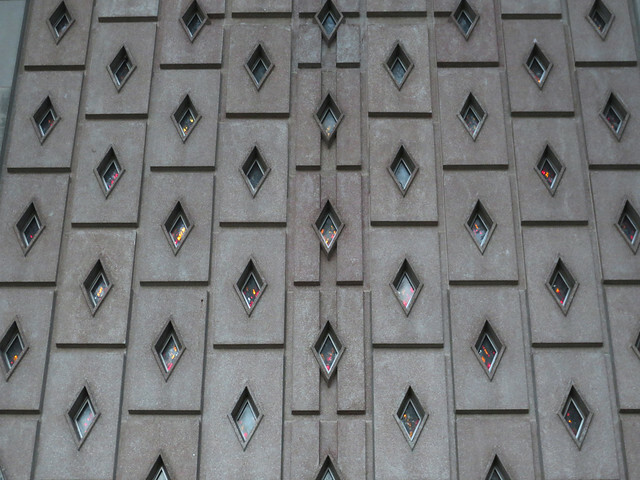 St. Pascal’s is no exception; despite all those geometric details on the outside, the inside is pure Mission Style. 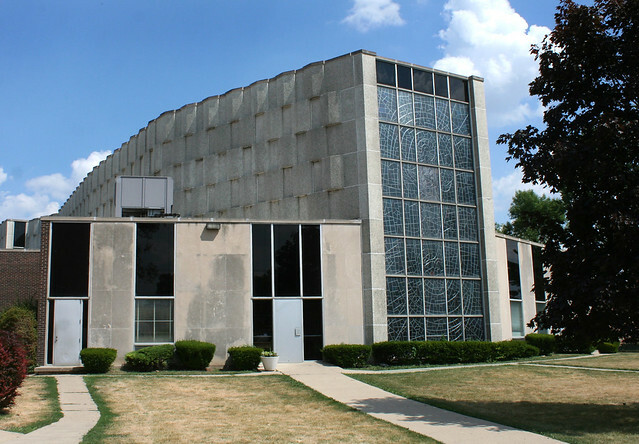 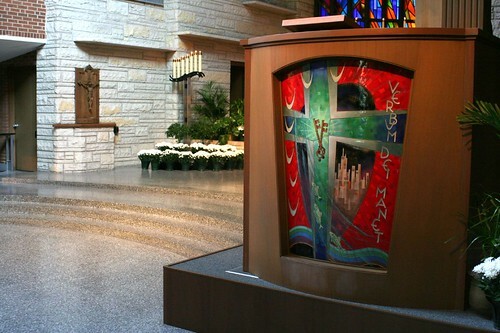 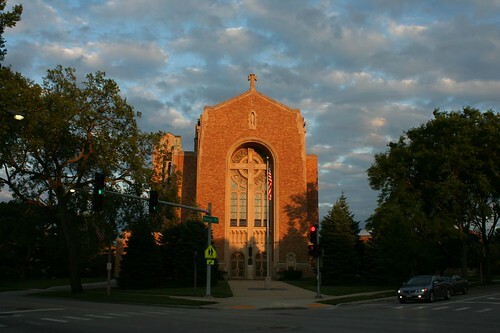 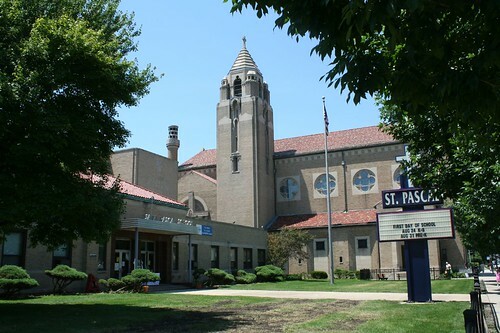 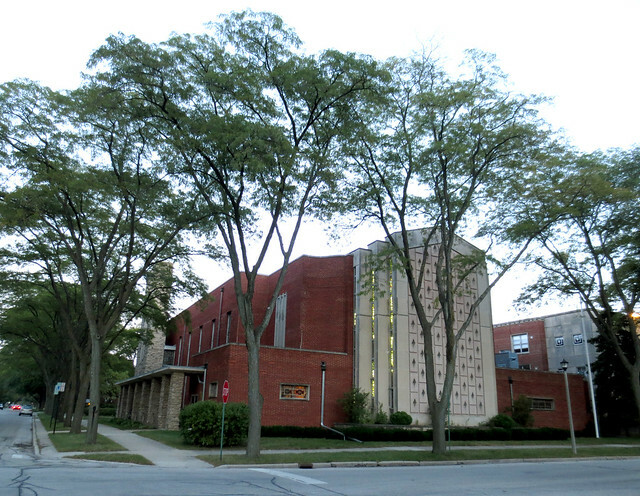 St. Pascal’s is a close stylistic relative of St. Joseph’s, the church in Wilmette that I covered previously. 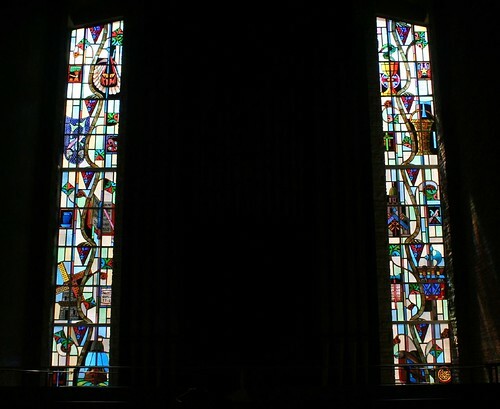 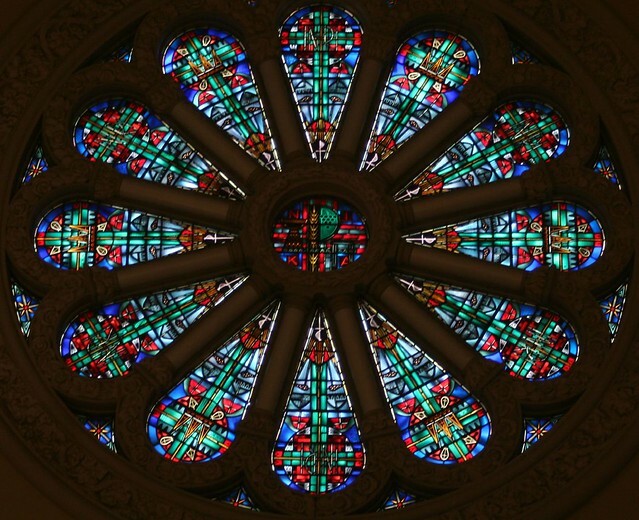 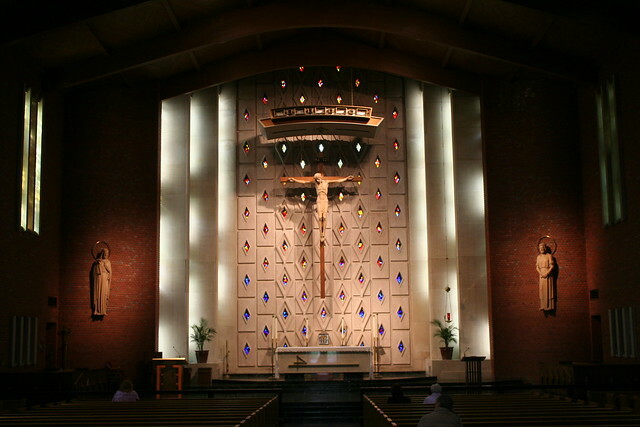 Both are tall and massive, with a shallow carved entry cove, bearing a massive cross with a rose window behind it. 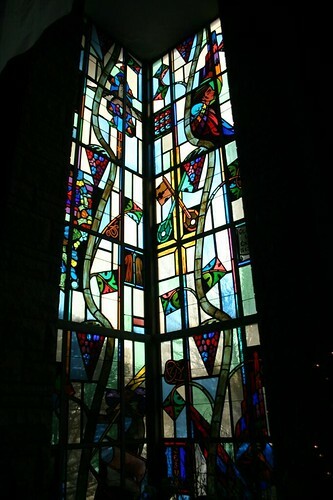 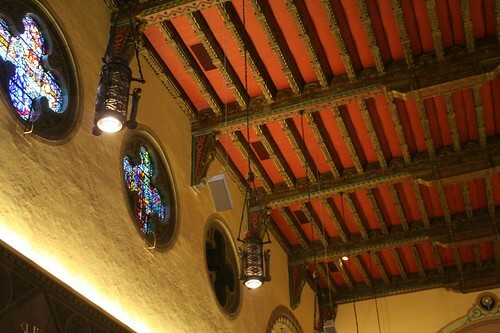 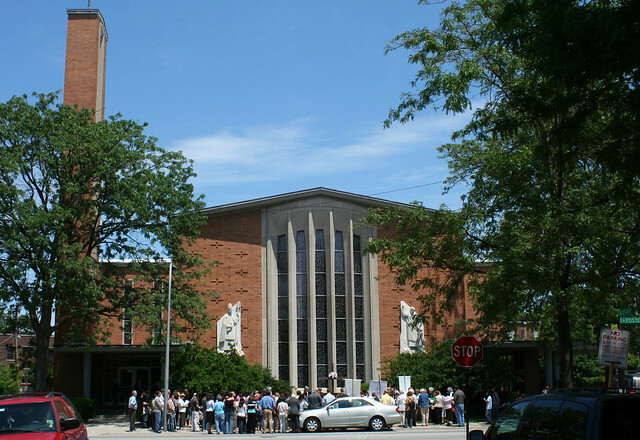 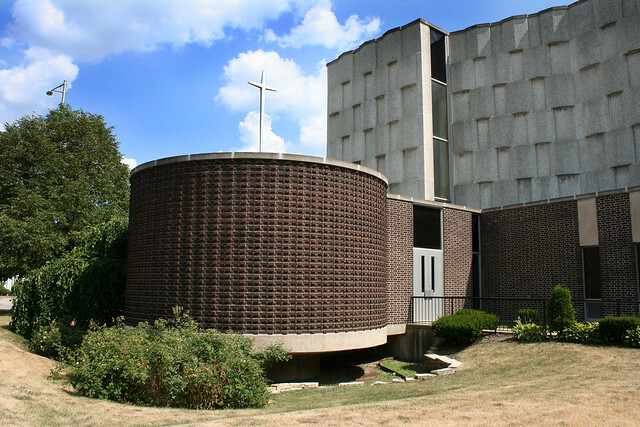 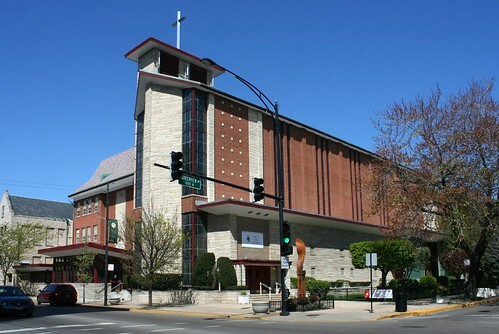 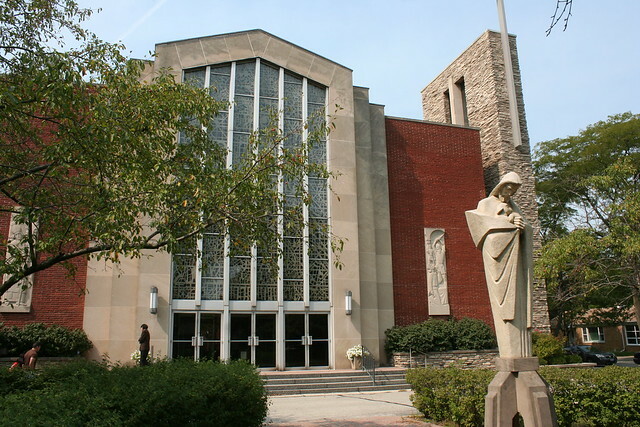 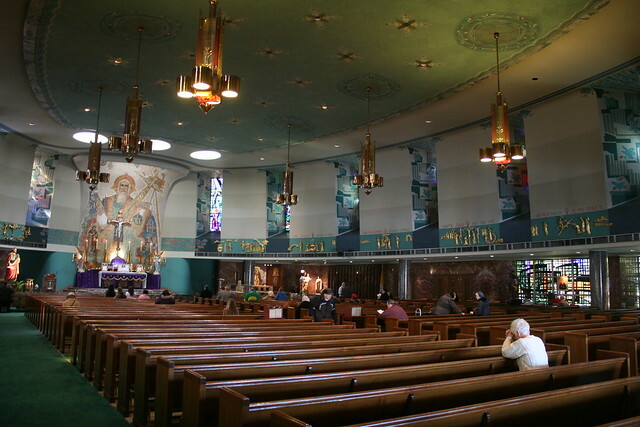 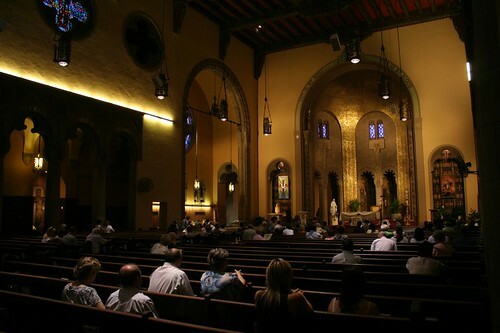 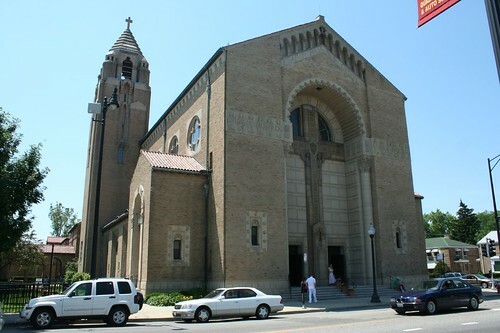 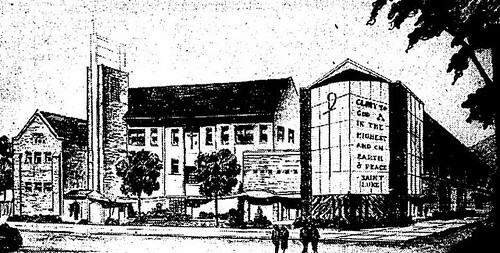 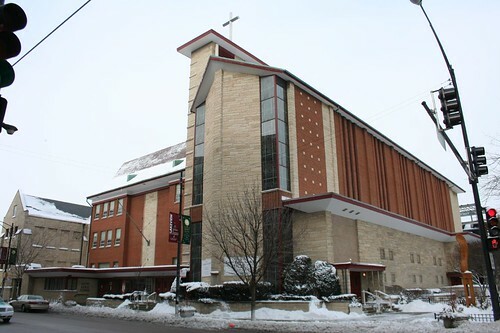 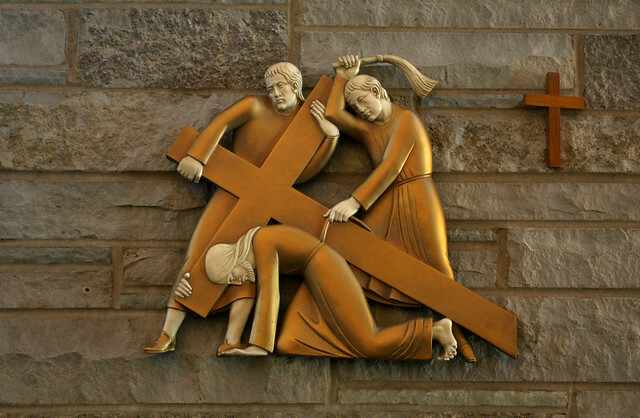 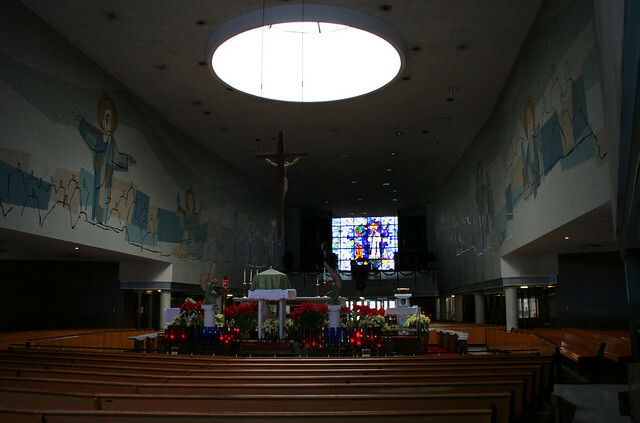 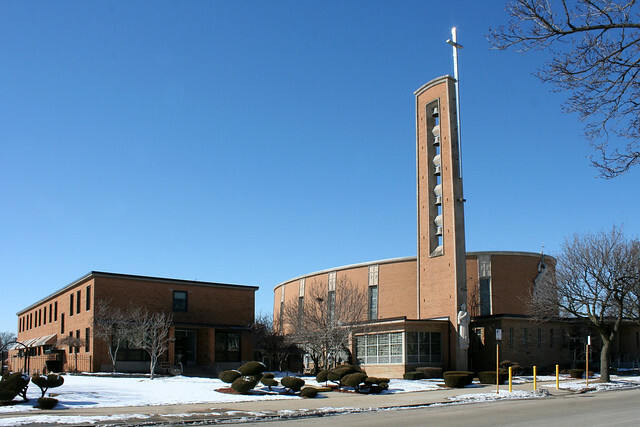 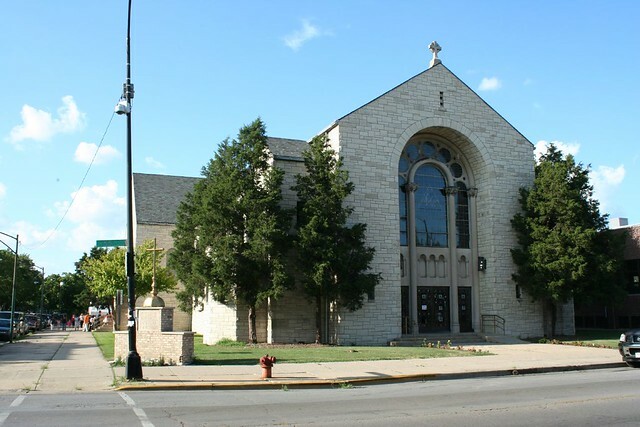 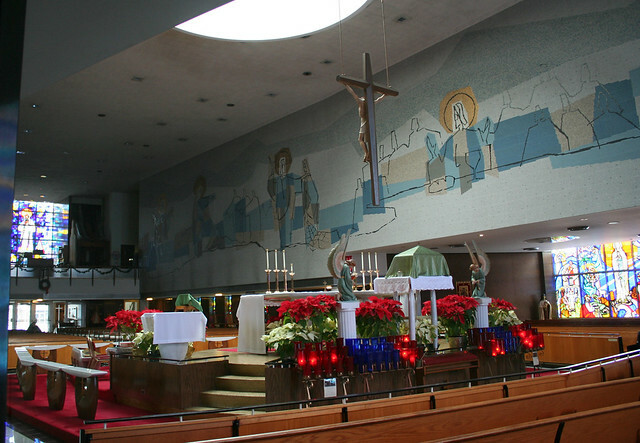 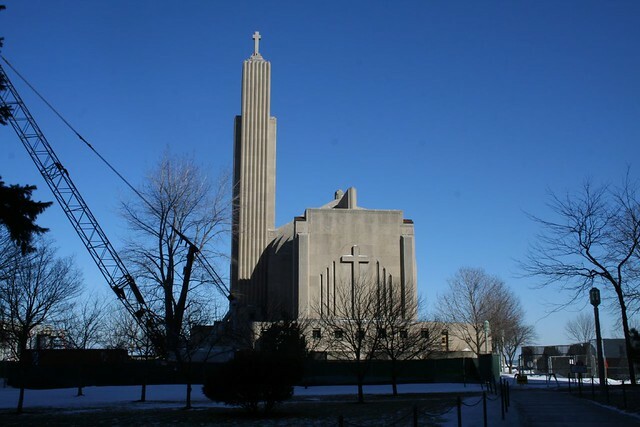 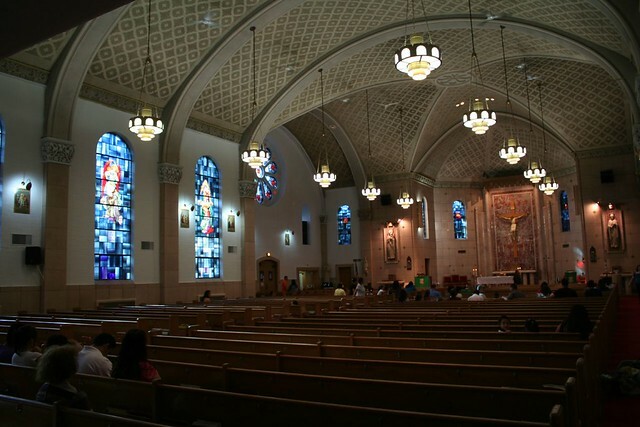 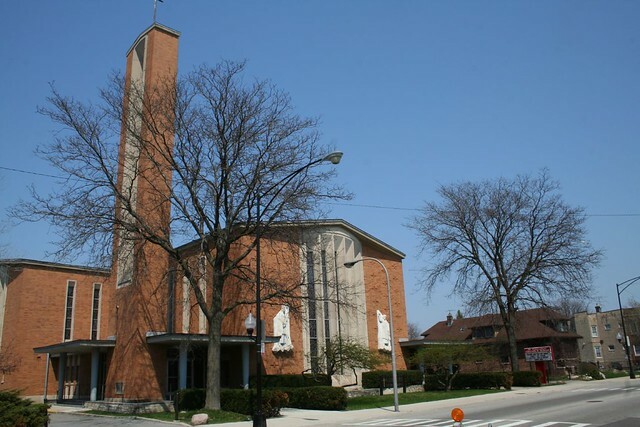 Then, there is Hyde Park’s St. Thomas the Apostle Catholic Church – 1929, Barry Byrne, architect. 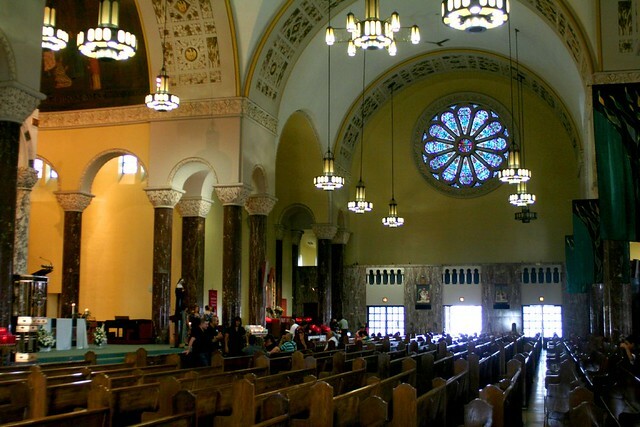 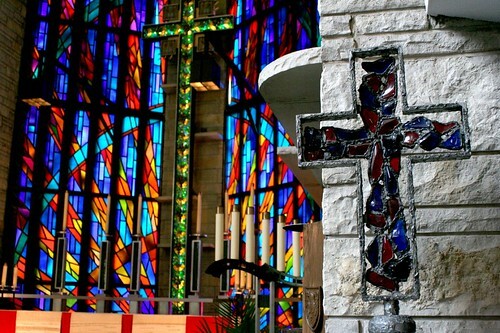 St. Thomas is one of the city’s most outlandish churches, mishmash of styles and influences that defies exact classification. 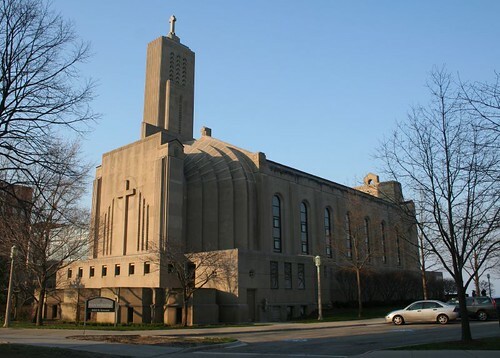 I mention it here in conjunction with Art Deco churches – but it could just as easily stand alongside Byzantine or Spanish Baroque Revival. 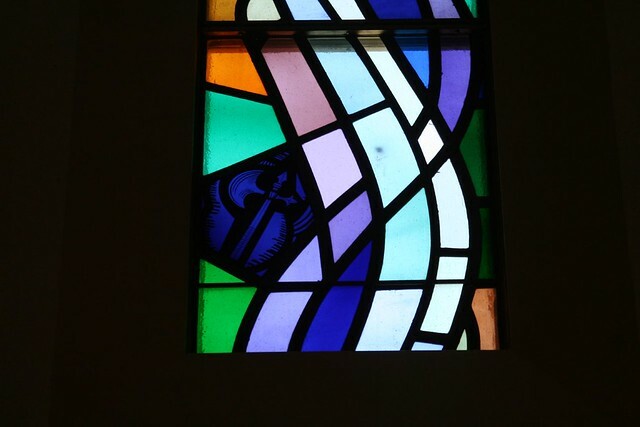 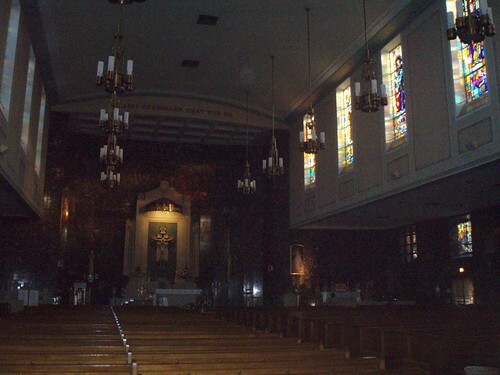 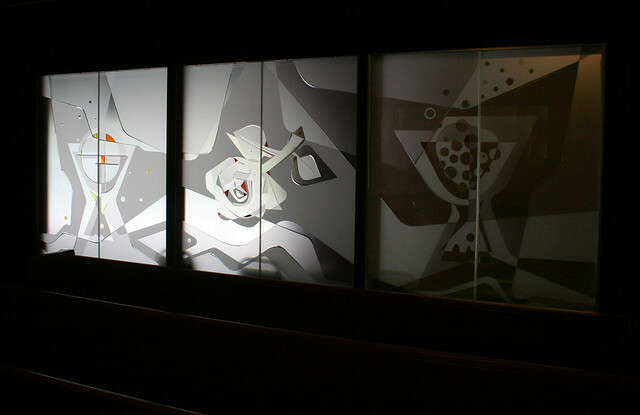 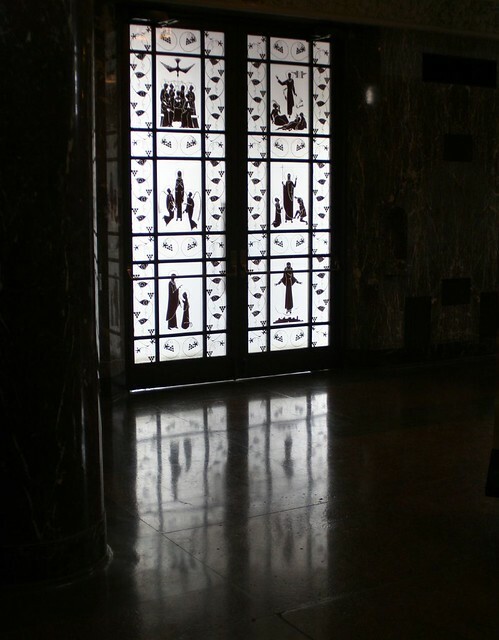 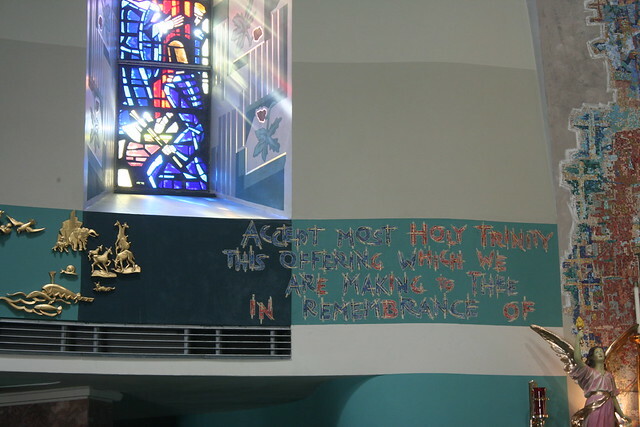 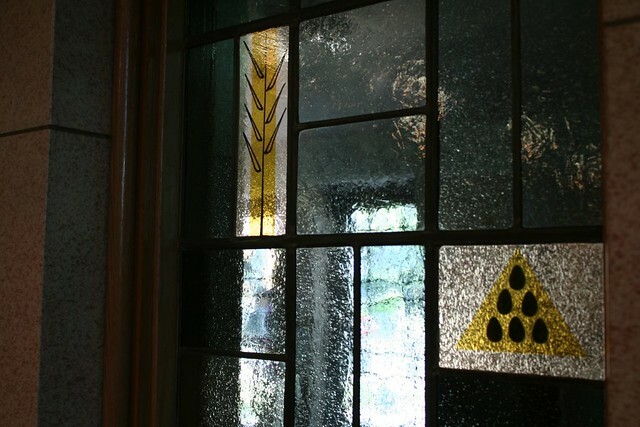 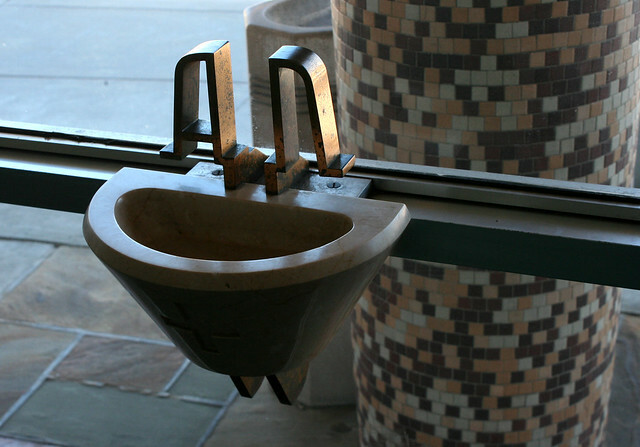 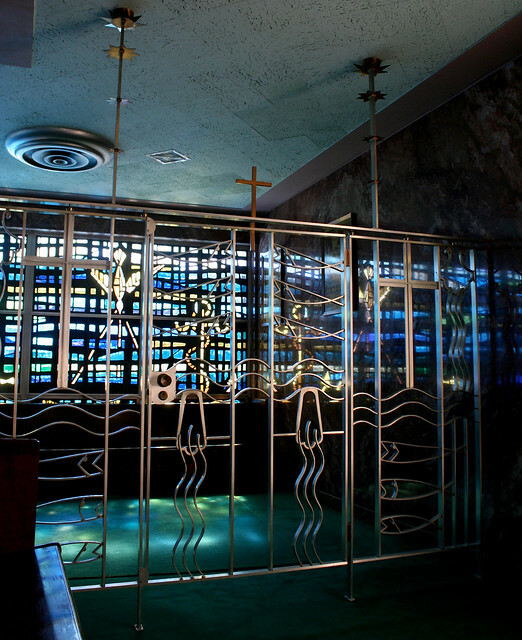 Inside, it’s surprisingly restrained – the closest thing I’ve yet seen to an Art Deco styled religious interior. 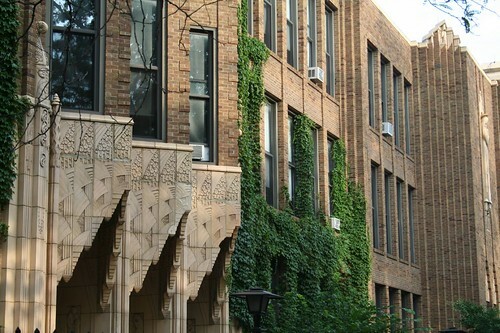 Outside, brick and terra cotta run wildly amuck. 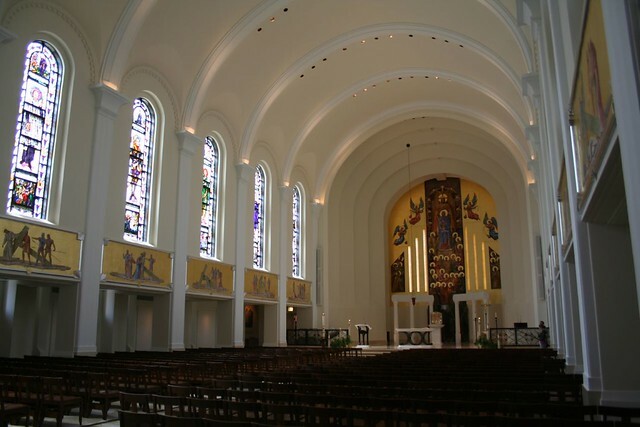 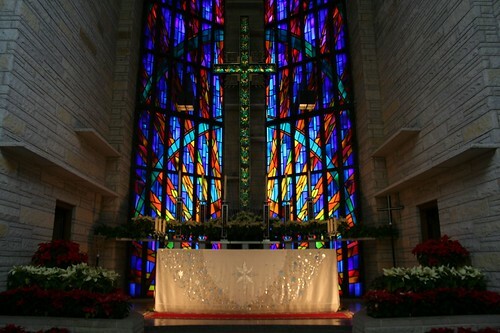 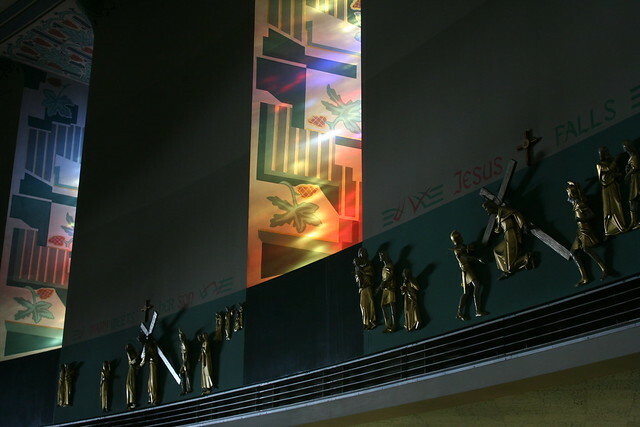 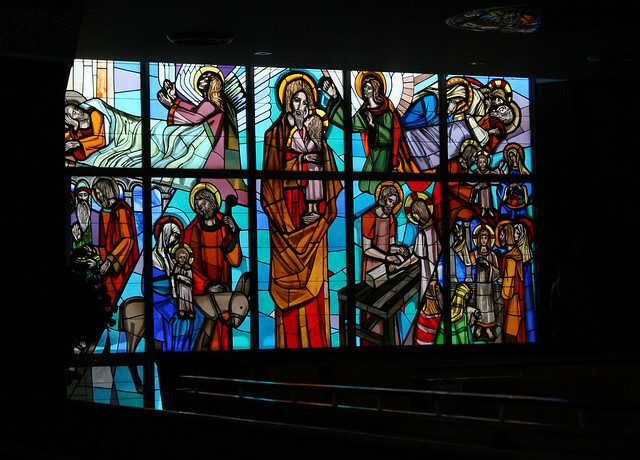 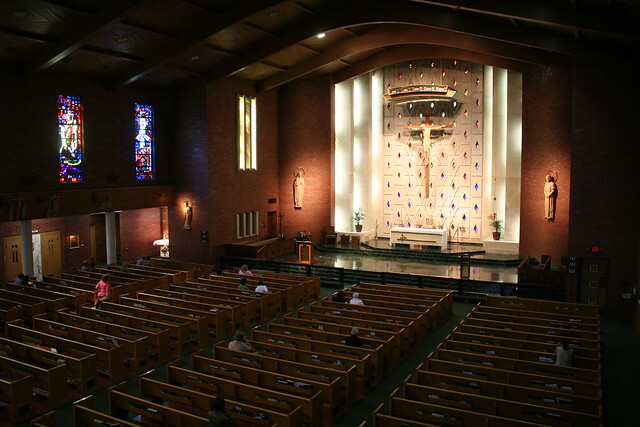 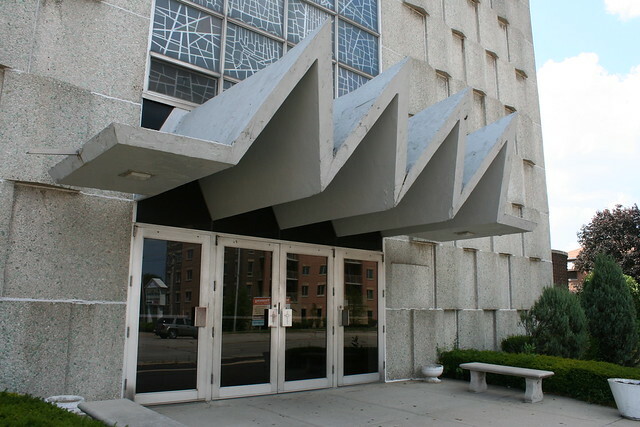 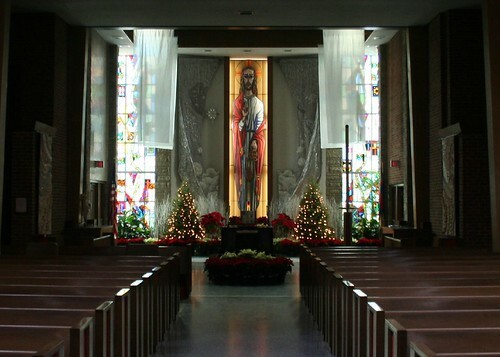 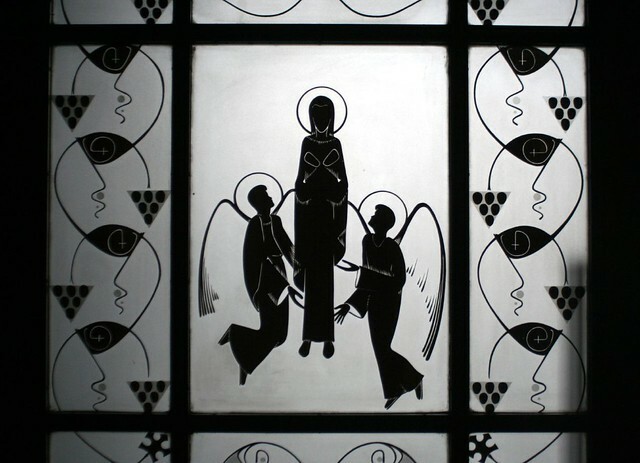 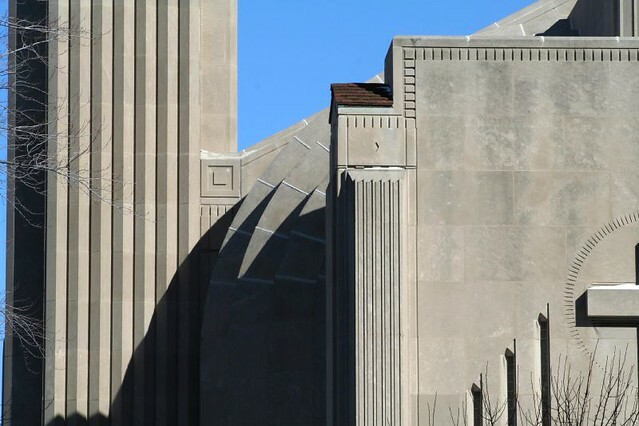 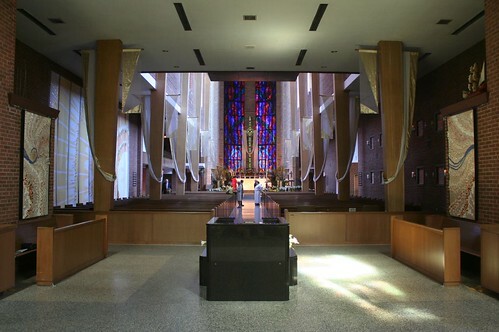 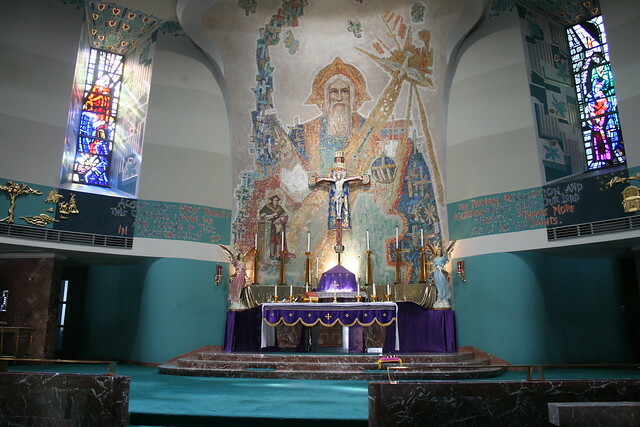 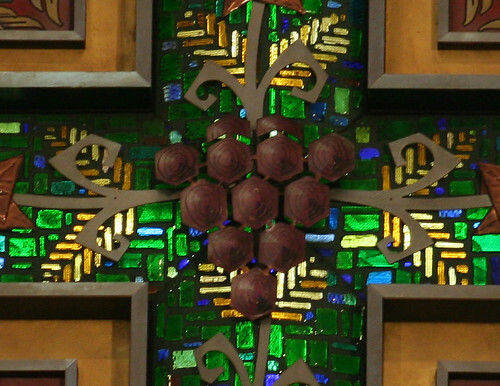 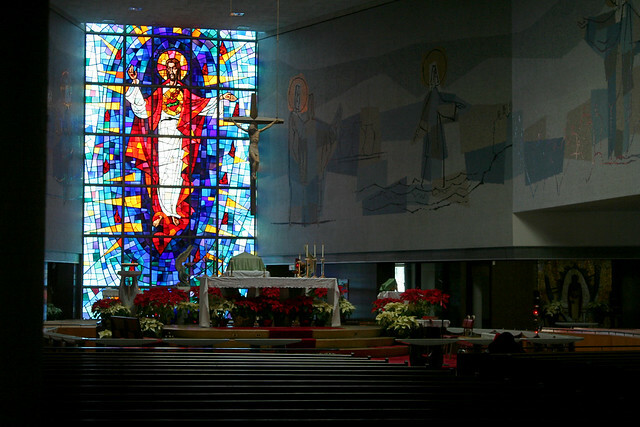 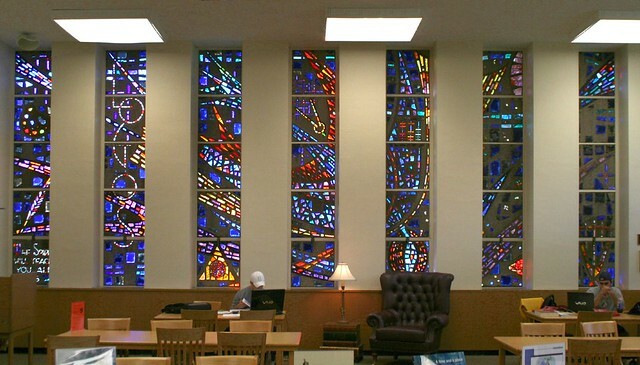 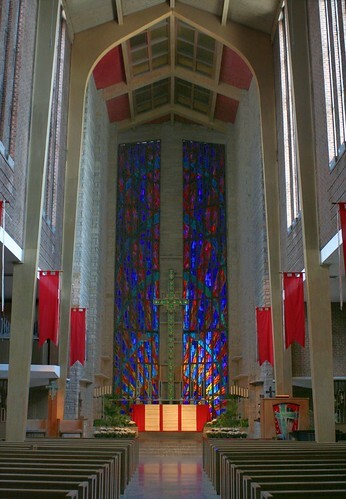 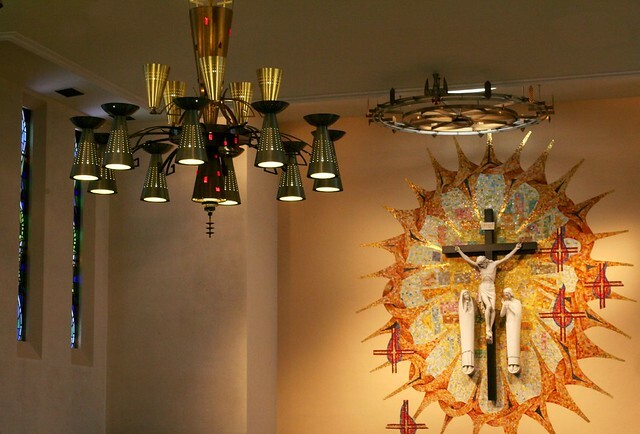 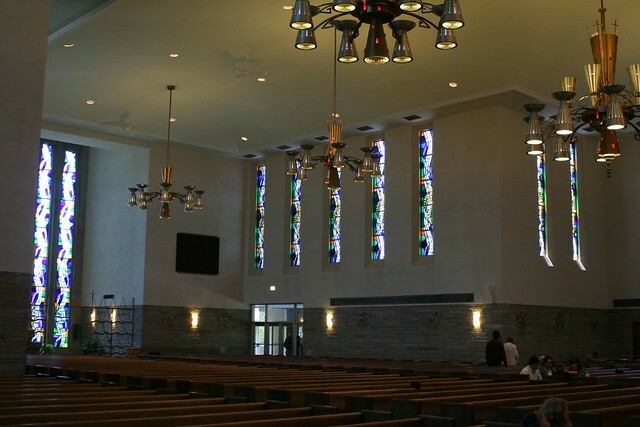 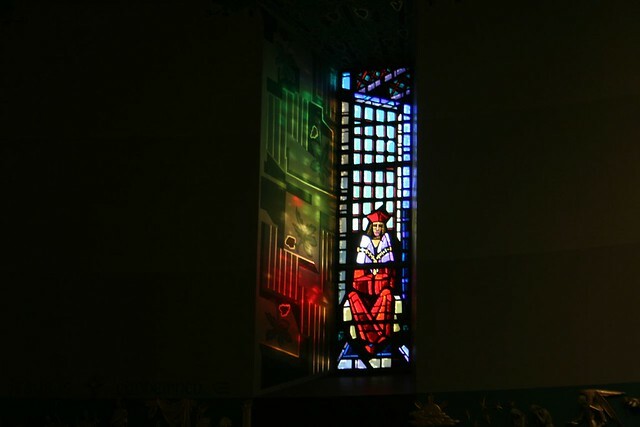 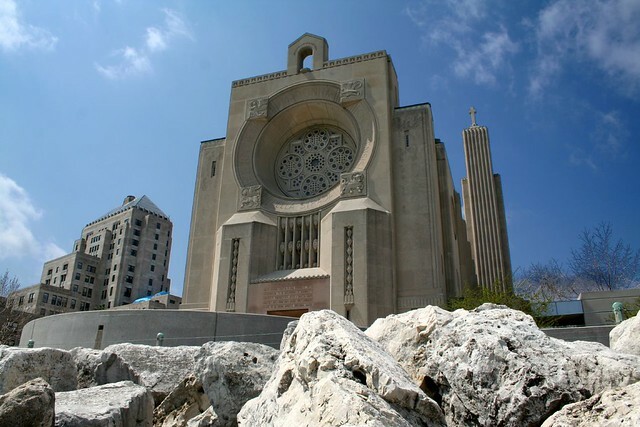 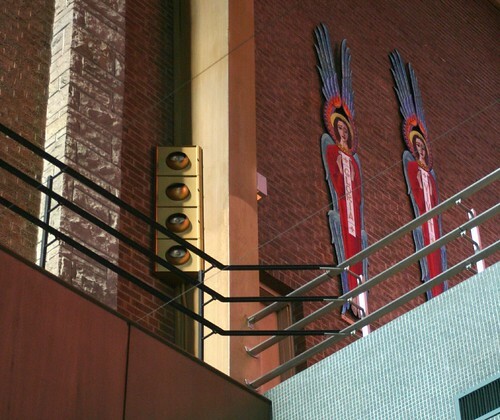 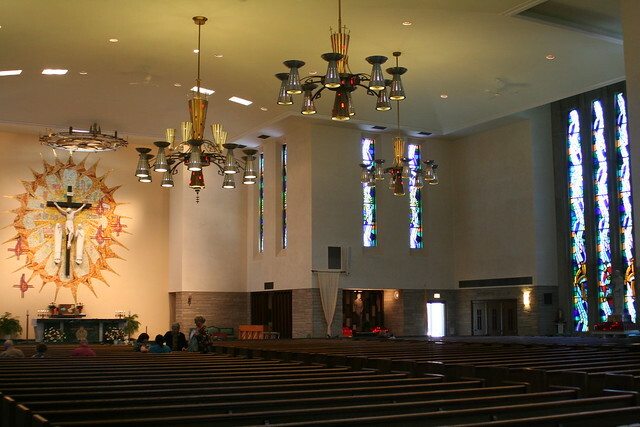 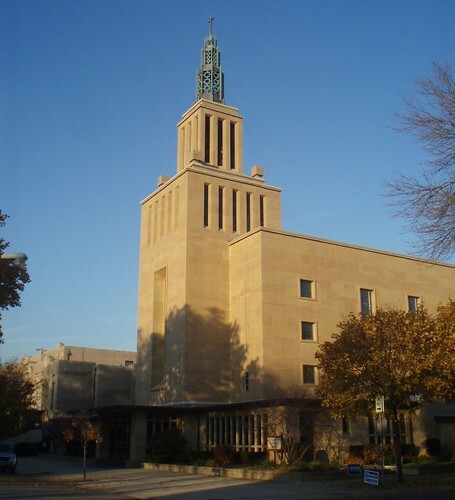 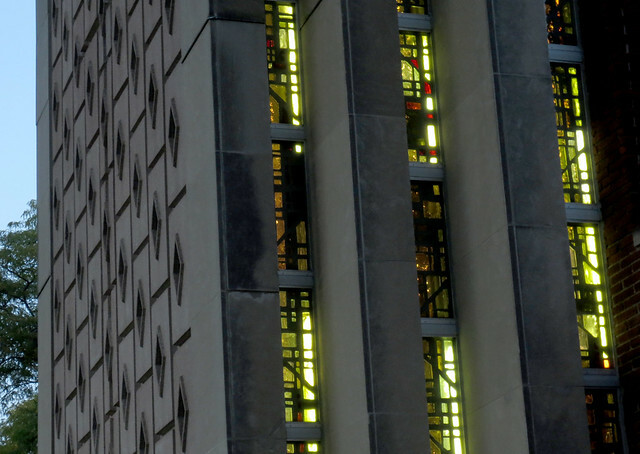 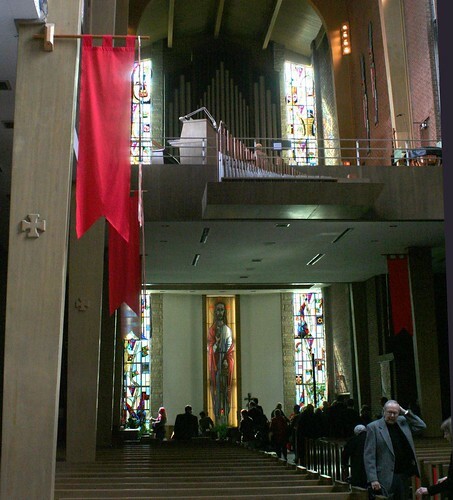 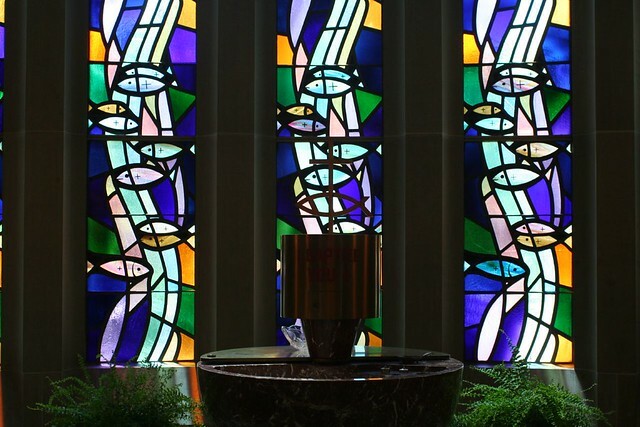 And finally, Andrew Rebori’s spectacular Madonna Della Strada chapel at Loyola University, opened in 1938, is the most unambiguously Art Deco example – perhaps the only one, in fact. 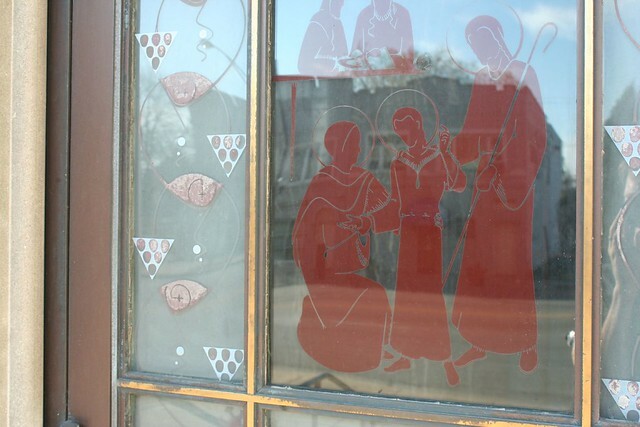 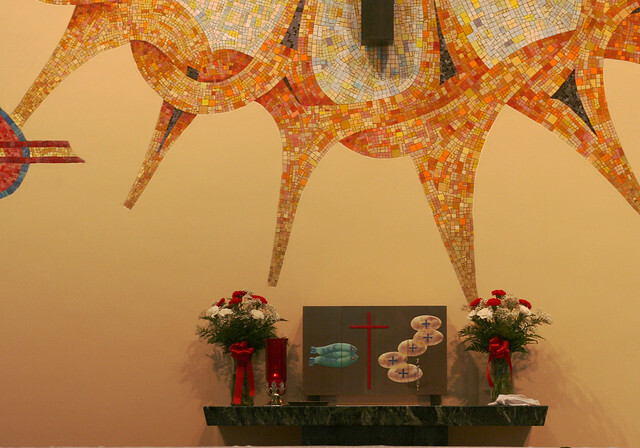 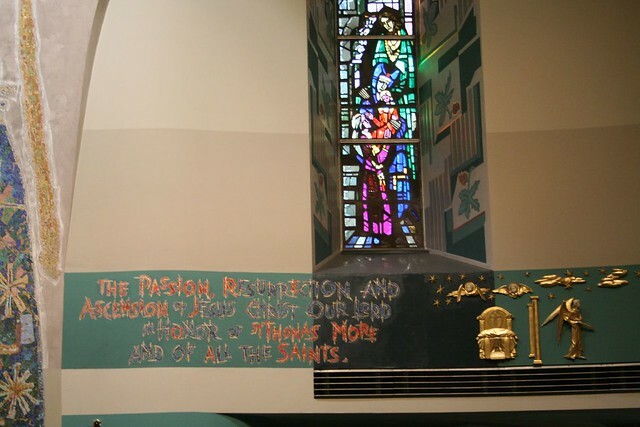 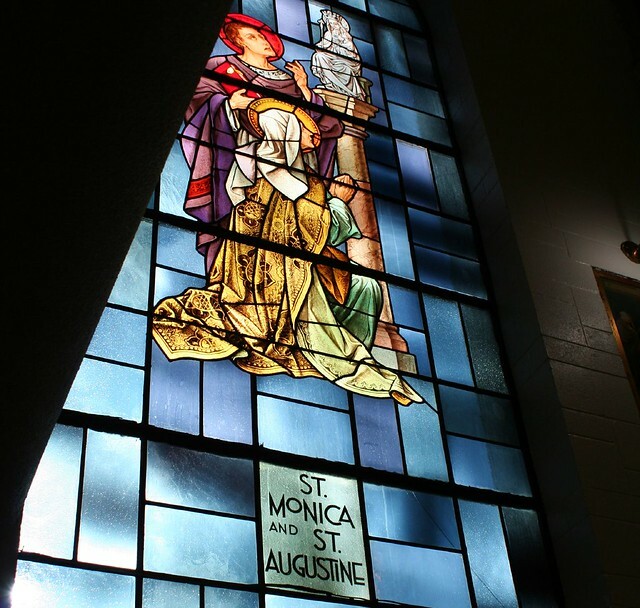 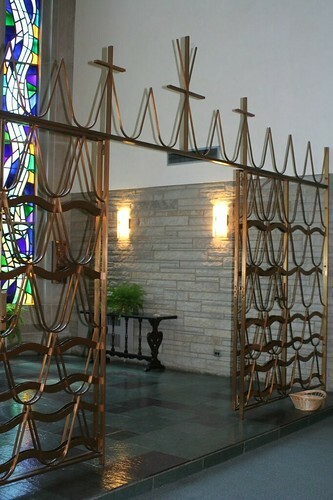 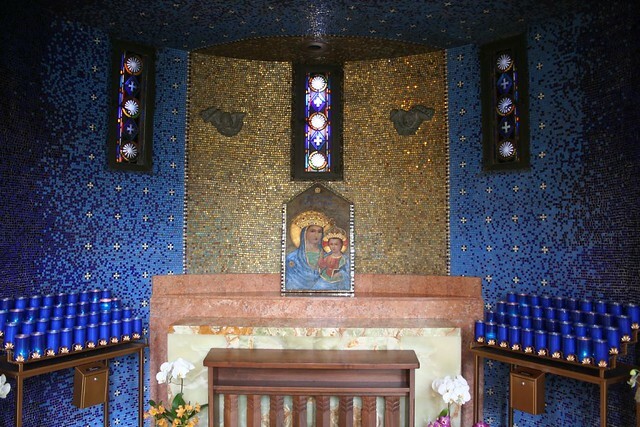 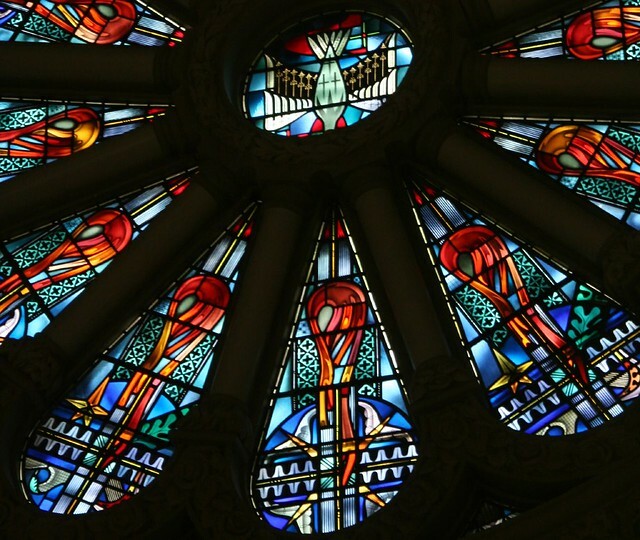 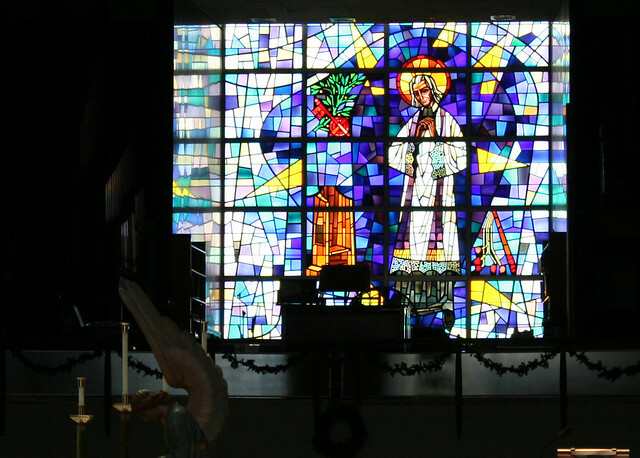 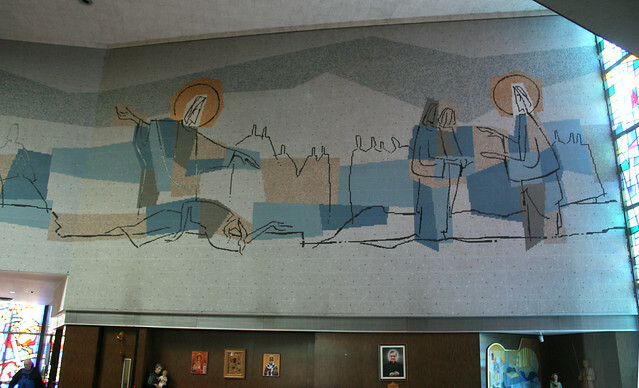 The Madonna della Strada (“Our Lady of the Wayside”) chapel was the dream and brainchild of Father James P. Mertz, who wanted a chapel honoring the patroness of travelers – such as young college students far from home. 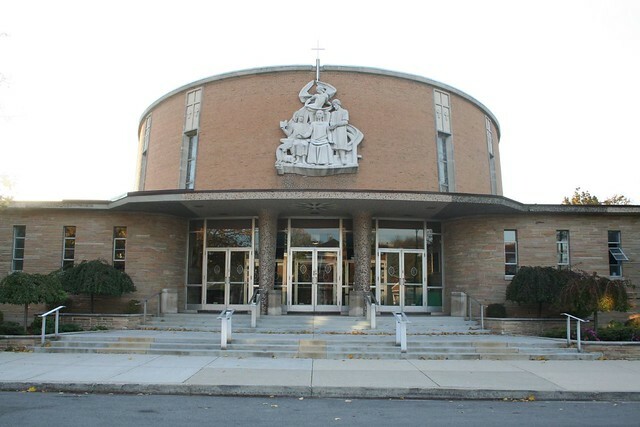 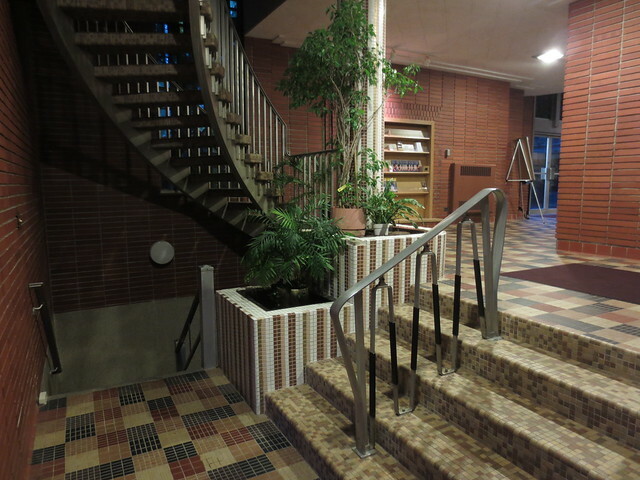 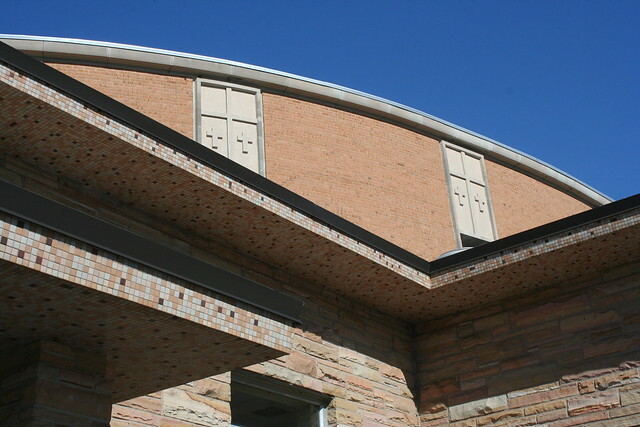 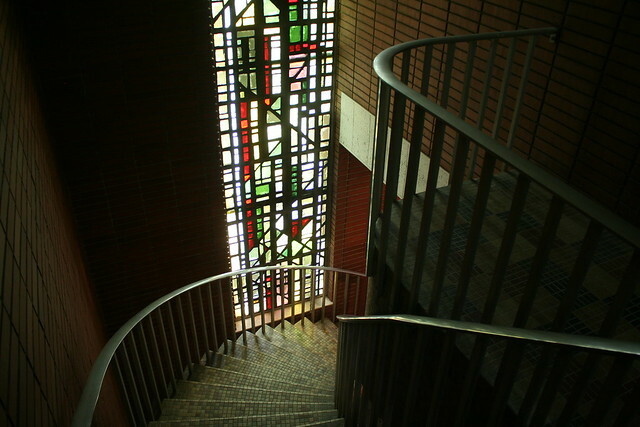 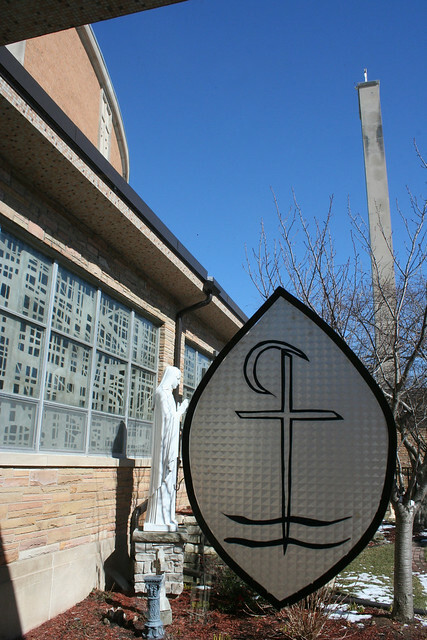 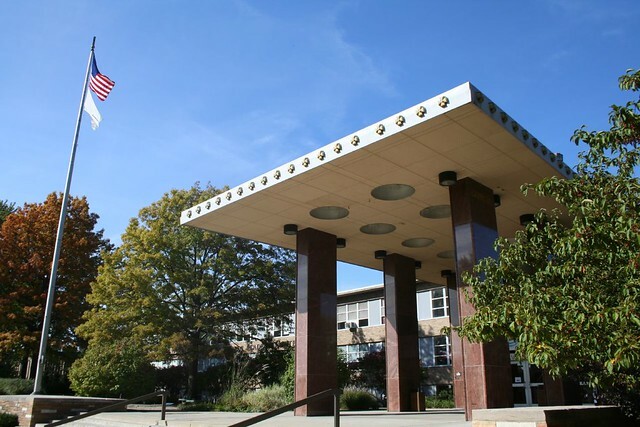 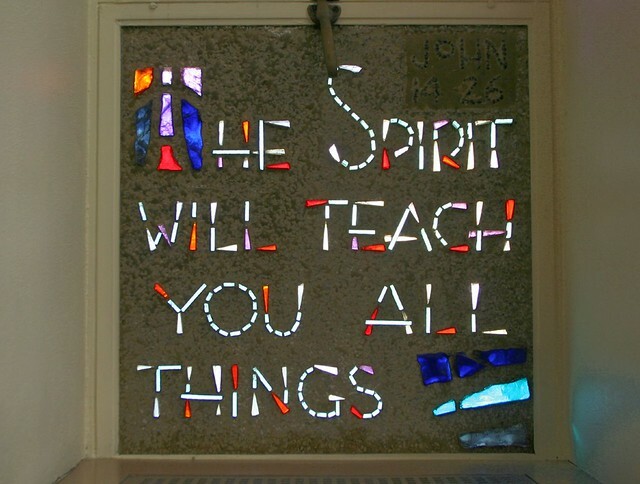 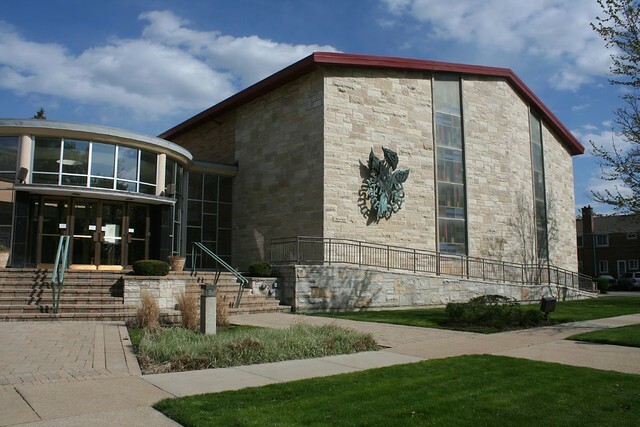 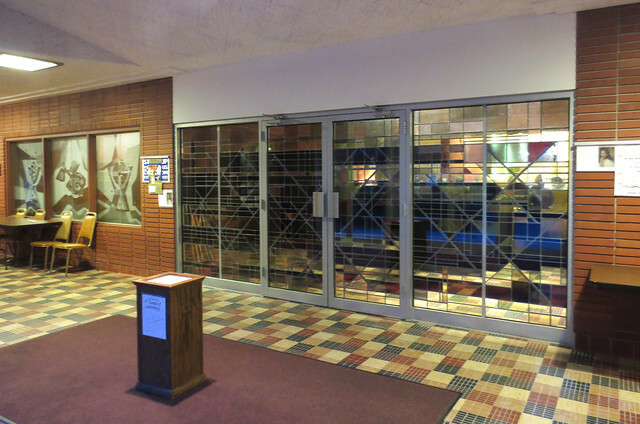 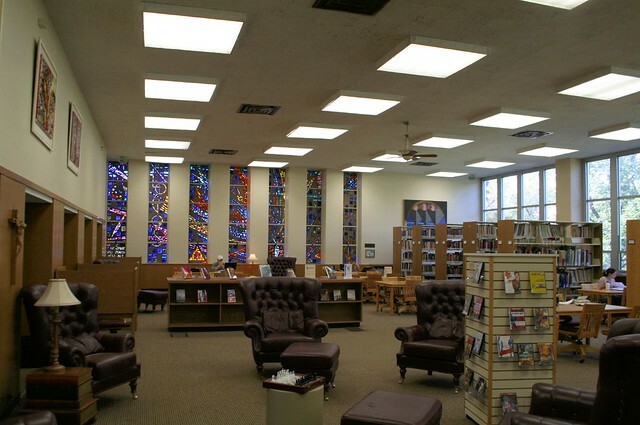 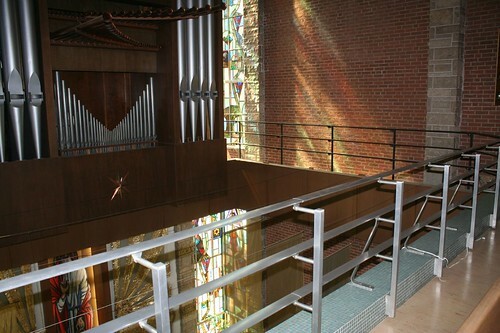 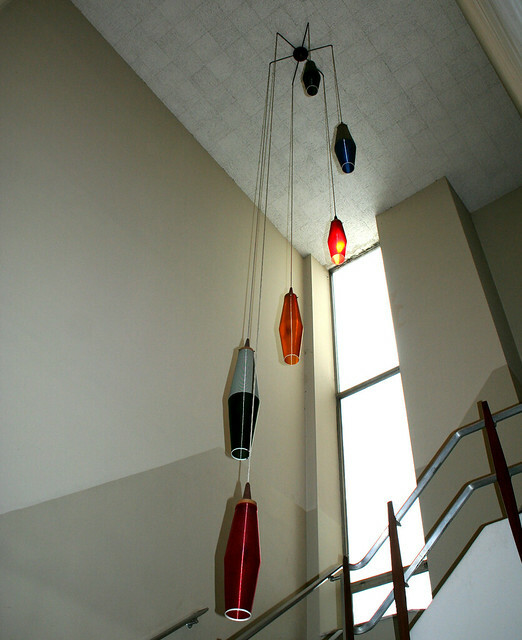 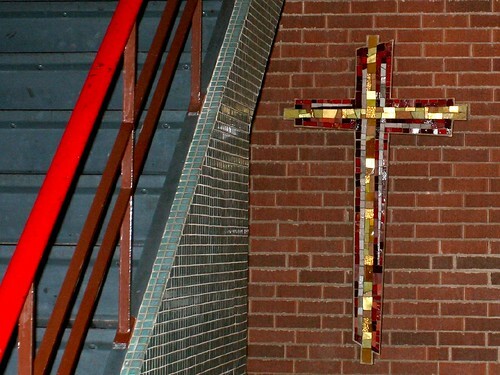 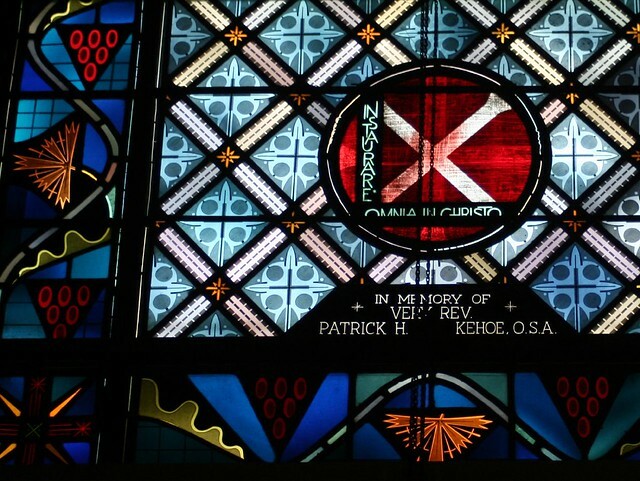 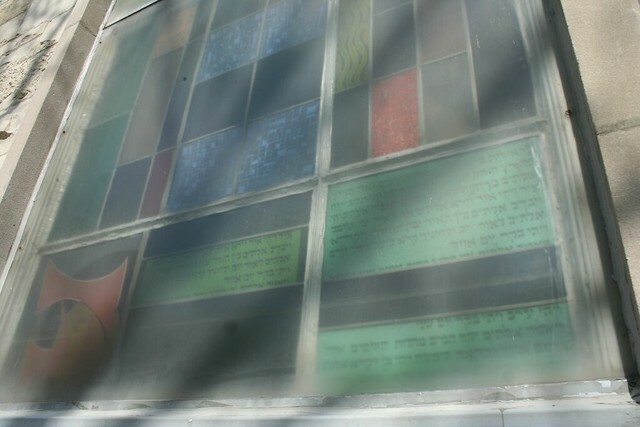 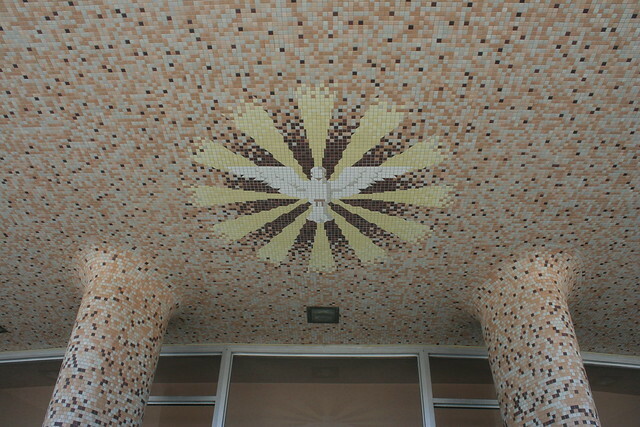 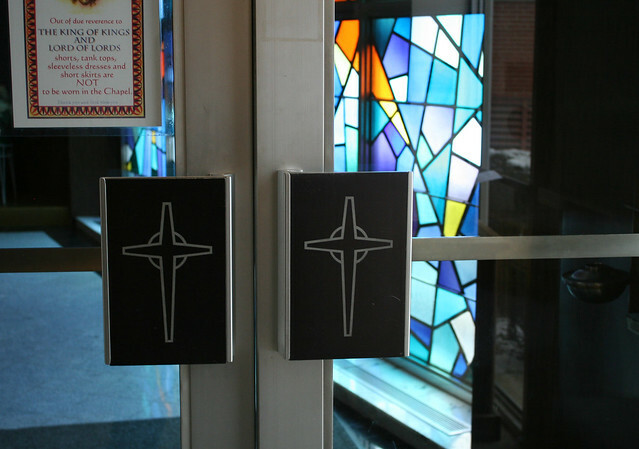 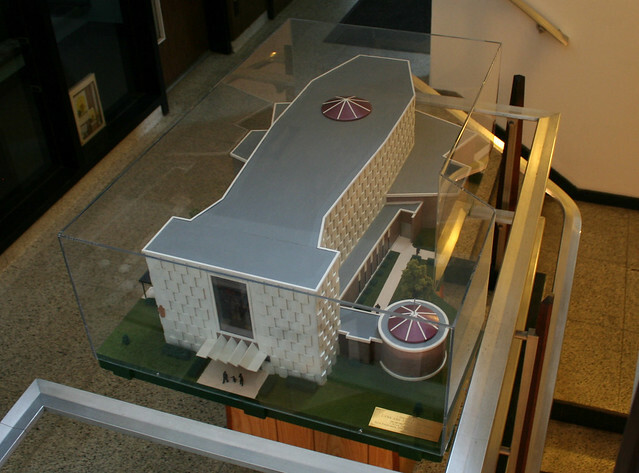 Father Mertz raised the money to fund the construction of the building’s shell, then continued the work of gathering materials to fit out the interior for another decade. 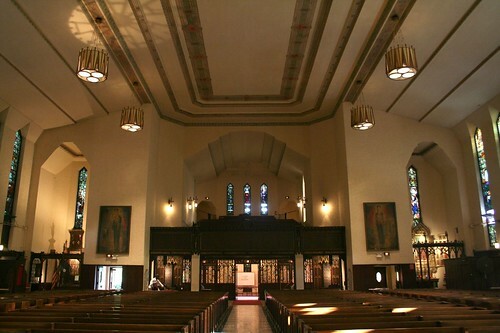 Compared to the radically sculpted exterior, the interior seems a bit tame, particularly the traditional-styled artwork and stained glass – but it’s still sumptuous in materials, with curved forms that echo the Art Deco style, and full of surprising little details. 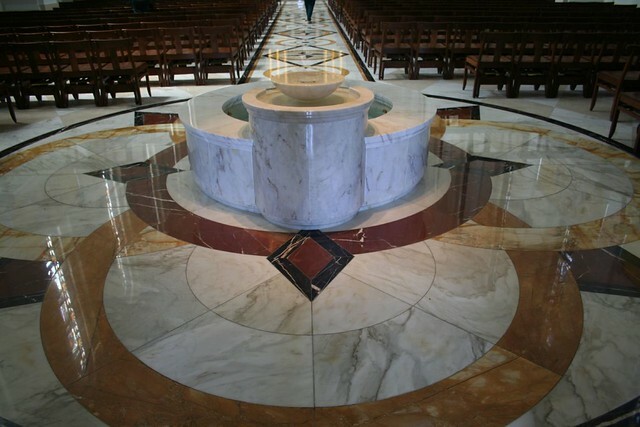 Dozens of marbles from around the world give the interior a lavish finish. 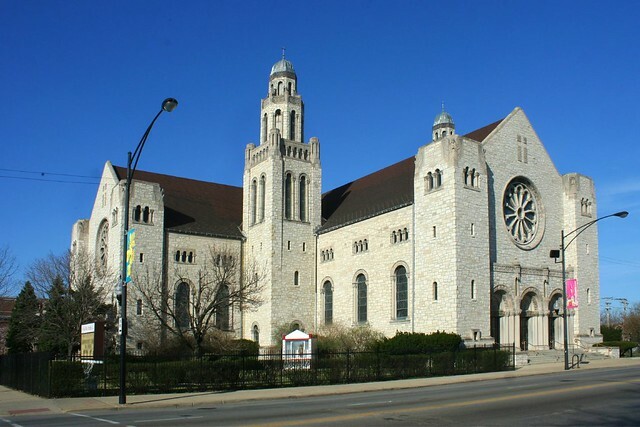 When the chapel was built, the assumption was that Lake Shore Drive would soon be extended further northward. 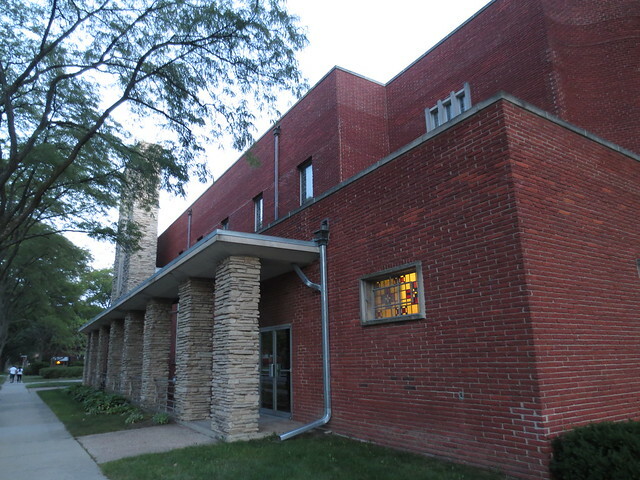 As a result, the “front” faces the lake, whose waters are only a few feet away.